WOW! Women On Writing Blog: What To Do With My Out of Print Book? What To Do With My Out of Print Book? So. . .the Chicago Cubs won the World Series! Some of you may remember I wrote a young adult book where the main character is Caught Between Two Curses, and one of those curses is the one that WAS on the Chicago Cubs--the Curse of the Billy Goat. Before this exciting World Series finale, my book was out of print, and I retained the rights. I've been wondering what to do with it. Should I self-publish or should I hang it up? Fortunately, my book was well-received by the few people who bought it. It got great reviews. Unfortunately, it turns out not that many young adult females want to read a book that was marketed as a contemporary young adult novel about the Cubs. My publisher and I thought it was a great idea, but it just didn't catch on. 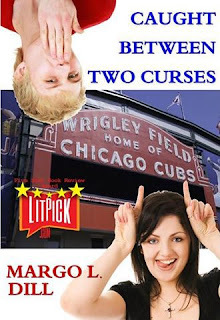 If I self-publish, I plan to play down the Cubs part because really, it's not too much about the baseball team--it's more about the curse. My main character, Julie, doesn't even like baseball. I've also decided I'm going to add some additional material, so that maybe some people who loved the first book will buy the 2nd edition. I plan to add a book club discussion, history of curses, an alternate ending, and a brand new short story. As a matter of fact, I plan on publishing the short story only in the book. It will be available no other place. I will also hire a graphic designer and editor because that's important--I want this to work out. I feel like I have an inside scoop on what didn't work, so hopefully, with a little thought and more marketing, it will be as successful as its reviews say it should be. So currently, to make myself do this, I am having a contest on my blog for the short story subject. (Check it out here.) I had three different ideas for this short story, and so I am asking for poeple's opinions. Anyone who gives their opinion is entered to win a $10 Amazon gift card. I am trying to generate interest in the book again and hope that people feel invested in my project. Plus, if I tell a bunch of people that I'm going to write this short story, help me; it will make me more accountable. Have you ever received the rights back to a book? What did you do? What would you do? I would love to hear your ideas. Margo L. Dill is a children's author, published writer, writing coach, editor, and blogger, who lives in St. Louis, MO. You can find out more at http://www.margoldill.com . Margo--No book for me, so I've never had to worry about what to do when the rights reverted back to me. It sounds like you have a great plan, you've learned from some of your minor mistakes, and you're ready to move forward. Good for you, and good luck! The sooner you can release it, the better for you, with the World Series win. Capitalize on it! Go! Now! Run! Yes, thanks. I need to get to work! Sounds like you've got some great ideas, and yes, cash in on the awesome timing of the win. Headed to your blog now to check out the short story ideas. I watched the last three innings of the last game -- I NEVER watch baseball but just switched channels to see who had won and got caught up in the whole extra innings thing. The whole time I'm saying to my husband, "A friend of mine wrote a book that had stuff about the Cubs in it. She must be so excited." going to check out your short stories right now!